Wat Mai temple, close to the National Museum and former Royal Palace. The Wat Mai Suwannaphumaham or Wat Mai (New Monastery) is one of the biggest and most beautiful temples in Luang Prabang. Its central position (in front of the night market and beside the Royal Palace) makes it one of the most visited temples of this ancient royal town. This Wat was built by King Anourout at the end of the XVIIIth century and was enlarged in the XIXth century. Its restoration, during the reign of King Manthatourat (1817-1836) gave it it’s final name of "New Monastery". 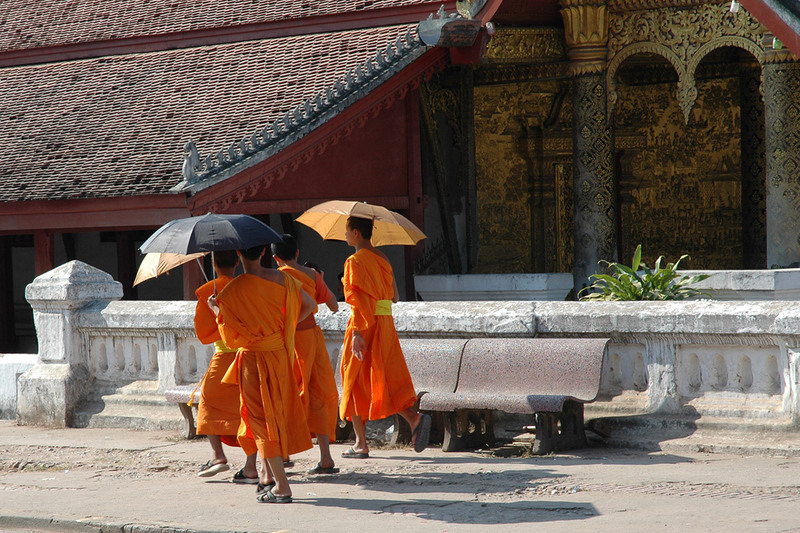 This temple is very important for the Laotians of Luang Prabang. After the Chinese had destroyed the town in the last half of the XIXth century, it served as a temple for the royal family, and also sheltered for a long time the Phra Bang, which is a mystical emblem in this country. It was also, the residence of the highest Lao Buddhist dignitary, Pra Sangkharat. During Pimay, the Lao New Year, the Pha Bang is put on display in this temple for 3 days. Devout Laotians from all over the country come to devoutly sprinkle the statue with water whilst making wishes. Wat Mai Suwannaphumaham (Si Souvanna Phommaram, Mai Souvana Phoun Ram), or Wat Mai (The New Monastery), is one of the largest, most picturesque and most photographed of the wats of Luang Prabang. Located along the popular night market street of Sisavangvong and adjoining the compound of the National Palace Museum, it is important for both its religious and its aesthetic beauty. The wat, founded by King Anourout (Anurat, r. 1795-1817) perhaps in 1796/7, dates mostly from the 19th century. Restoration of the wooden sim possibly started in 1821 or 1822 during the reign of King Manthatourat (r. 1817-1836), when it was given the name of The New Monastery. The double colonnaded porch in front and a similar, though less elaborate, porch in the rear were added at that time. Work on on the sim, library and other ancillary building it continued until the 1890s. A number of other structures are from the 20th century. 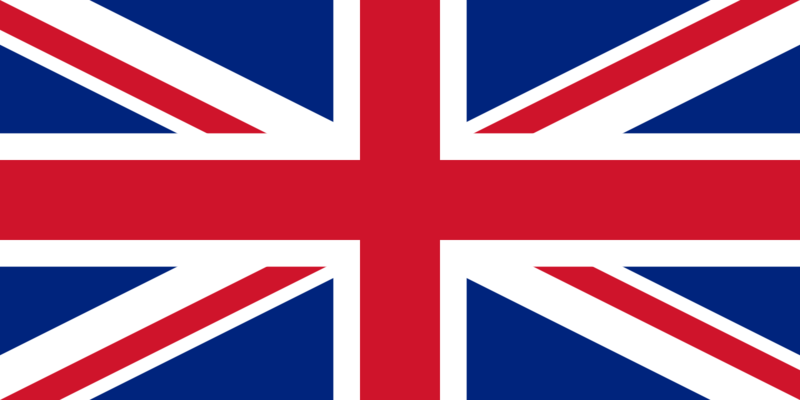 There were major restorations in 1943 and 1962, as well as in more recent times. 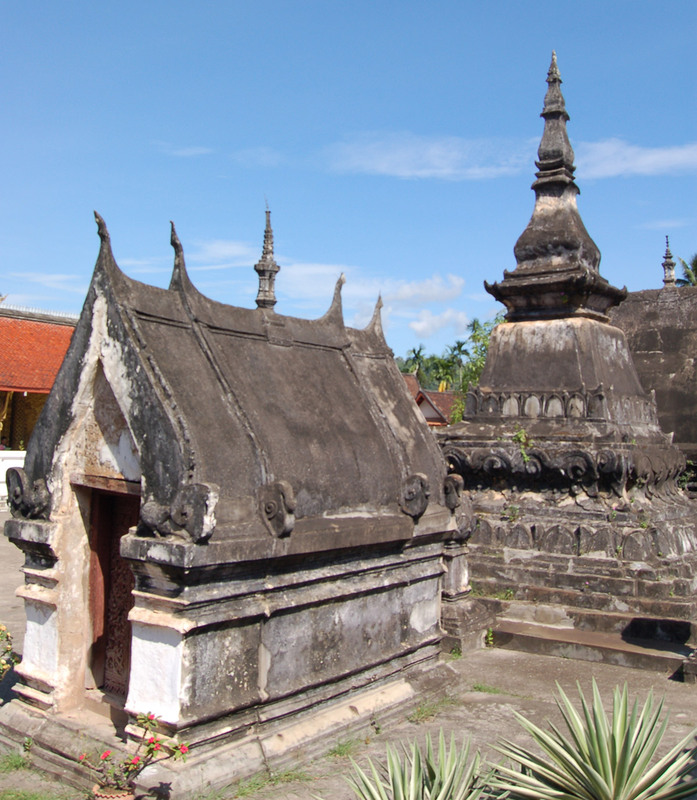 The sim is built in the traditional Luang Prabang style with added porches on the two sides. The monastery has special significance for a number of reasons. It served as a temple for the royal family and long has been the residence of the Pra Sangkharat, the highest Laotian Buddhist dignitary. As a result of the Chinese Haw raiders that ravaged much of the city in 1887 (the wat was spared, perhaps because of its beauty), Wat Mai became the repository of the city’s palladium, the Prabang. In 1947 the 50" gold statue was moved to the royal palace, now the Royal Palace Museum. During Pimai, the mid-April Laotian New Year, the Prabang is ceremoniously brought from the museum to a temporary pavilion in front of the sim; for three days there is ceremonial washing of the image and opportunity for the faithful to pay homage. The abbot of Wat Mai also played a role in the opening of Luang Prabang to the world outside of Asia. In 1887 Auguste Pavie, who had a strong admiration for the region, arrived in Luang Prabang as the first French (and European) vice-consul in Laos. At the time the city and region was under the Siamese; they tried to isolate Pavie and his group from the king, Oun Kham, and interfered in a number of ways. The abbot, however, a confidant of the king, served as a conduit for messages between the king and Pavie and invited him to stay at the monastery. French influence grew and by 1893 Siam was forced to recognize the French protectorate over Laos and its incorporation into French Indochina. Pavie was also allowed to examine the extensive palm leaf manuscripts of the monastery and used them to write the first extended early Laotian history in a European language. The monastery’s sim is most noteworthy. Its five-tiered roof (including the sections over the side porches) is a most magnificent sight. Its expanse is readily viewed from the adjoining elevated sidewalk on Thanon Sisavangvong. Its front veranda extends across the width of the nave and protects the gilded bas relief on the front façade and other decorations. The magnificent relief dates from the remodeling of the late 1960s. The cement reliefs were first covered with a black lacquer and then gilded. The entire relief stunningly depicts scenes from the Ramayana and the Vessantara-Jakata, the Buddha’s penultimate reincarnation, within the villages and flora and fauna of the world around Luang Prabang. 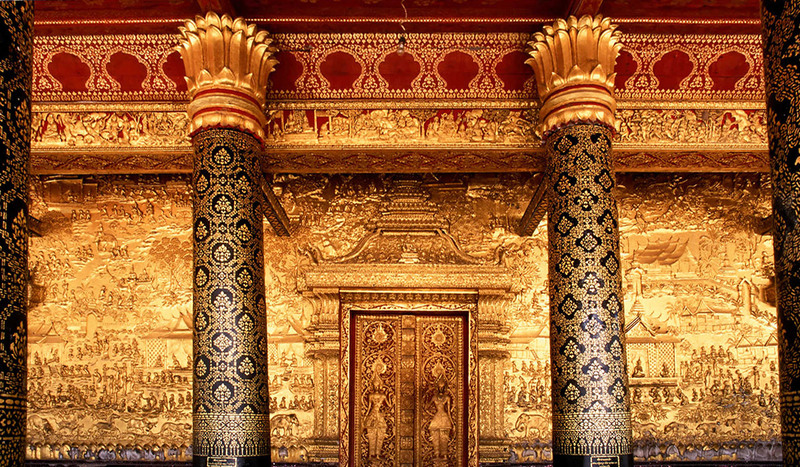 The large and majestic red interior nave with gold stenciling on the columns, beams and walls together with the variety of gilded Buddha statues and tables at the altar and the large Buddha statue provide evidence of the religious, aesthetic and architectural importance of Wat Mai. It is during the three day festival of Pimai (the Laotian New Year) that the faithful outnumber the tourists and provide additional evidence of the centrality of Wat Mai, not only to the residents of Luang Prabang, but also to the Laotian people.